With the coming the New Year, a number of blogs gave recommended readings for the upcoming year. I’d like to do the same, and recommend two books to read carefully over the course of the coming year. On a more personal note, Matthew is my favorite Gospel, for a whole host of reasons. For one thing, it is just so Jewish. If you like the exploring the Jewish roots of Christianity, Matthew is definitely the first place to go. 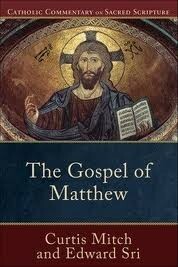 Moreover, if happen to be a teacher, then you’ll know that Matthew’s Gospel is also a remarkably catechetical. I know this from experience, since in the classroom, I constantly fall back on Matthew for addressing major theological, moral, and spiritual issues. Those are my two cents for New Year’s reading recommendations. Read both books together, and I promise you won’t be disappointed.